A general framework is given to analyze the falsifiability of economic models based on a sample of their observable components. 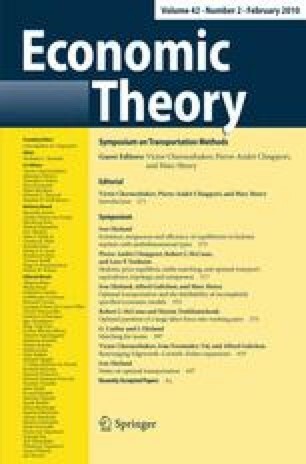 It is shown that, when the restrictions implied by the economic theory are insufficient to identify the unknown quantities of the structure, the duality of optimal transportation with zero–one cost function delivers interpretable and operational formulations of the hypothesis of specification correctness from which tests can be constructed to falsify the model. This paper results as the combination of two manuscript circulated under the respective titles “Part 1: Parametric restrictions on latent variables” by A. Galichon and M. Henry, and “Part 2: Moment restrictions on latent variables” by the three authors. Financial support from NSF grant SES 0532398 is gratefully acknowledged by the three authors. Alfred Galichon’s research is partly supported by Chaire X-Dauphine-EDF-Calyon “Finance et Développement Durable”. The three authors are also grateful to Victor Chernozhukov and Pierre-André Chiappori for many helpful discussions.